A more common problem is that you have already opened the can of stain, completed your deck and it is now only half-used. What can you do in this case? Most opened stains can last 12+ months if stored correctly with the lid tightly sealed. If the substance has contact with the air, the solvents will evaporate and you won’t be able to use your stain again so it’s important to ensure the container is sealed correctly. The ideal environment for storing your deck stain is a cool, dry room with a steady temperature. You should also ensure that the stain cans are not exposed to direct sunlight. Sometimes you are left with a few half-used cans of stain. In this case, you’re better off mixing them together. The tips outlined in this article are there to help you save money. If you follow them, you will increase the shelf-life of your deck stains. Was scrolling through the comments & was wondering if anyone has used Penofin stain. Also, is the 4 month wait time dependent on the brand of stain you use or all stains in general? I’m having a cedar fence installed on the east & west sides of my house & live in the Pacific Northwest. Any thoughts/suggestions on what to use? Thank you. There are numerous reviews of Penofin on this site. The issue with Penofin is that it has a tendency to darken in color or even turn black. Yes, you have to wait to stain new wood. 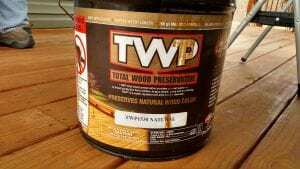 Try TWP 100 Series.